Flutters about and spins around. 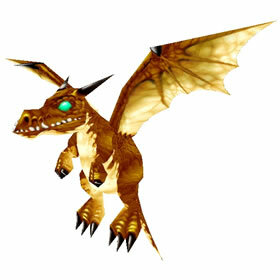 The Bronze Whelpling was implemented during the 6.0 patch leading up to the expansion, Warlords of Draenor. Players can find Iron Horde throughout the revamped level 90 portion of Blasted Lands. Any of the Ironmarch orcs has a chance to drop the pet. Rushes the enemy, dealing 354 Magic damage, or 492 Magic damage if the user strikes first. Deals double damage if the user has lower health. Seals the target in crystal, stunning them for 1 round. Deals 413 Magic damage split between all enemies and warps the weather into Arcane Winds for 9 rounds. Does additional damage if Arcane Winds is already active. During Arcane Winds, pets cannot be stunned or rooted. Finally got this one to drop! I was at about 500-600 kills and came to check the best drop areas, and moved up to Okril'On Hold. It dropped within 40 kills up there! Thanks for the tip! Finally got it to drop. But it was 976 kills before it did. I am very lucky. Dropped for me today while running the quests to get another Iron Starlette. And yes, using a lvl 104 havoc DH was fast. Also just caught this. Took about...maybe 7 hours of listening to music. Got the s/s which I think is really good with his stun? PRO-TIP: use a havoc Demon Hunter if you can. They're super mobile and have a ton of aoe for the fastest clears possible. If you've got one at level 108 you can get 2 charges on Throw Glaive which really helps. Confirming that this still drops. I wasn't one of the lucky ones. Took months of around 6hrs a week or so of off and on farming. Finally got one after several hours, but it won't register on the site! Got a rare today after killing about 30 mobs! I see conflicting information that this no longer drops after the 10th anniversary event. Is that true? Does this pet still drop? Ugh. I was so frustrated because the drop rate made me feel like this wouldn't take a long time. It ended up taking me about 3-4 hours of solid grinding on mobs at the hold. I stopped keeping track at 1000 kills but I'm sure it was in the 2000 range. Just make sure you go in a sweep of the whole area in like a V shape and pull as many as you can in one go. Mine dropped in the Blacksmith hut. I got this after about 15 kills....from the sounds of it I was pretty lucky. Can I get it again? Shoudl keep farming? Unbelievable! I got this after only 38 mobs. I'm definitely going to be paying for this bit of luck with my next grind. I nearly gave up on this one after 1500+ kills. However I hopped back over just to try for a few minutes and finally got mine. It was really frustrating since it looks like the drop rate is so high. But, stick with it...it's worth it. 1134 Kills (rarity count) for me to get it. I found the best place to farm (by far) was the Nethergarde Mines. A continuous loop of groups of 3 to 9, never waiting for respawns. Mine was a P/H. 2051 kills later I *finally* get this pet, H/P breed. Got this in the mines, but also did my share of time at Okril'lon Hold as well. This dropped for me today in Nethergarde Keep. I was just messing around on my level 100 druid and starfalling everything and it dropped after about five minutes. I didn't even know what it was at first! Don't hate me! The Bronze Whelpling was lost in time until an unusual event allowed her to escape.